Did You Win the Whole Set of Coton a Broder? It’s the last day of the year! And to celebrate the end of 2012, let’s find out who won the Coton a Broder thread set from my give-away last week! Thanks again to Joady at Hedgehog Handworks for putting up this wonderful gift for one of you! Joady recently had occasion to use coton a broder in one of her own stitching projects, and she liked it so much that she decided to stock the whole line of coton a broder 25 in all available colors at Hedgehog. I’m really excited about that, because now I can find literally all my favorite-but-not-available-locally threads in one place. Wow – we all have them, don’t we? And they’re all fairly similar. Some of the most common answers to the question What’s your embroidery daydream? included more time, dedicated workspace, an isolated week or so for stitching, classes at the Royal School of Needlework or the EGA or Beating Around the Bush, organization and supplies …. I recognize those daydreams, that’s for sure! You’ve all pretty much voiced my own thoughts on the matter! Time for the randomly drawn winner. I know, I know. There’s only one winner! If I could spread thread worldwide, I would! Well, Stephanie, you didn’t get time, classes, or people under your tree – but I hope you enjoy the threads! Please contact me with your mailing address and I’ll get the set off to you as soon as possible – hopefully even today, since tomorrow’s a holiday. Thank you, each of you, for participating and sharing your daydreams! I loved reading them. We’re all such kindred spirits, aren’t we? Happy New Year’s Eve! How are you ending 2012? Here in Kansas, I’ll be organizing and preparing some stuff for you for down the road – all the while, waiting for a little snowstorm to hit (fingers crossed!). Wherever you are, whatever you’re doing, I hope the last day of 2012 is a good one for you! October 20, 2017 Boost Your Embroidery Stash! A Thread Give Away! 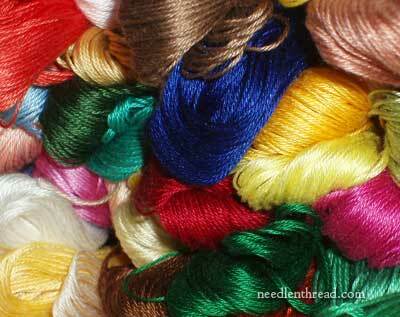 February 15, 2014 Embroidery Thread Give-Away – Luscious, Fun Colors! Congratulations Stephanie! Have fun with the coton a broder. BTW–I sincerely hope your family received one of the many Kissing Pillows that have been stitched/donated for our deployed service persons. What is a Kissing Pillow? Is it possible to join in creating one? And we’re into 2013 here in eastern Oz! All the very, very best to everyone for the New Year. Stephanie, you’re truly bringing in the New Year with a fireworks of colours, all 182, and drawn from over 1200 names. Hearty congratulations. Very special New Year Wishes for you Mary. Thank you for a most enjoyable, friendly, greatly interesting learning year with Needle n’ Thread. On the bright side… Happy New Year. Congratulations! What a wonderful gift to start to the new year. I confess I’m a bit of a floss junkie. Floche and silk don’t need to be used, just touched. LOL Be brave, use this new collection of threads and create something wonderful for 2013. Yay for Stephanie! Please forward our very deepest and heartfelt gratitude to your husband for his service as well. Hope you see him back in your arms safely very soon! Congratulations Stephanie! I’m so glad you won — enjoy! So very happy for Stephanie. Congratulations, Stephanie! I’m very happy for you! Stephanie makes me chagrined that I even wanted those threads! She deserves them! You couldn’t have picked a better name! Enjoy them Stephanie and I wish I was close enough to babysit while you stitch a little while! Just a stitching grandma from Texas! Congrats to Stephanie! We’re all happy for you and a BIG THANKS to Joady for her generosity, and Mary for her great website!! Happy New Year of wonderful stitching to ALL! I hope you have fun with your new floss. By the way, I hope you have a New Year filled with luck and love. You and your husband have made the most difficult sacrifice, the sacrifice for others is admirable and I thank you. I pray your husband returns safely and he can play again with your little angels. Best wishes to all for a better New Year!!! Congratulations Stephanie how wonderful for you!!! and a very happy New Year to you Mary I hope 2013 will be a blessed year for you and thanks for all your hard work here at Needle n Thread I look forward with anticipation to all your future embroidery blogs in 2013. Have a blast exploring your new thread collection! As a mom of 6, and a Navy wife I know how hard it can be to find stitching time when the kids are little and you are on your own. Don’t forget to carve out a few minutes a day for yourself. As the saying goes, you can’t take care of anyone if you don’t take care of yourself. Very best of wishes to you and yours for 2013. I pray every day for peace so that all the soldiers can come home to their families. Sending Stephanie and Mary and all the 100s of us who secretly hoped we’d be the lucky winner, lots of love and happiness n health for 2012. Congratulations on winning the big prize, Stephanie, and a heartfelt prayer for your husband’s safe return. I didn’t know that attending the Royal School of Needlework was such a common daydream until after I had submitted my comment. I guess we stitchers have lots more in common than I ever imagined. Congrats stephani. Thanks mary for a wonderful year of embroidery classes and wish you a happy and peaceful 2013. I just love it when you provide us with information about materials and books that may not be available in OK where I live. My dream would be to have my sewing room stocked with high quality materials and threads so I can just sit down and create whenever I get inspired. I am disabled and housebound. It takes a lot of planning and making of arrangements in order to get supplies to start a project and many times I have to just give up on it. Congratulations Stephanie! My son who was recently discharged from the army was stationed at Fort Bragg before and after being in Iraq. He was in the room when I read who had won. I was so excited for you. I knew it was an extremely long shot but I had to ask him if he had known a Melton at Ft. Bragg. Of course he hadn’t, but I am so glad it was you who won. May the thread keep your spirits up until your husband comes home. Watching toddlers by yourself with no relief can be so hard. I, too wished for a stitchy friend but did not find one underneath my tree. It sounds like you need one more than I, and I hope you find one this year. Congratulations again. Hurray, Stephanie! Have fun with all those gorgeous colors. If I could give you a few hours of my stitching time, I would. I remember being a young mother trying to make time to stitch, and I didn’t have the extra cares of being a soldier’s wife. As for help learning stitches, my advice is to look for a chapter of the Embroiderers Guild of America in your area, or check at local needlework stores for info on any local stitching clubs. I’ve stitches for years and years but still learn something new at just about every meeting. There’s nothing as helpful as being able to actualy watch and learn. God bless you and your family, and my thanks to your husband for his service. And to you, too! You may not be the one in uniform but I know you serve as well. congratulation to the winner….and happy new year to all. Many congrats to Stephanie , what a wonderful rainbow to start 2013. Mary, I wish you a very happy and prosperous New Year. I enjoy your site tremendously and admire your work. Good luck with it and your exciting new projects this year. I think you picked the perfect winner! Congratulations Stephanie! Those sweet babies will grow up all too soon and you will have lots of time to stitch. Enjoy your threads! Next Next post: Needle ‘n Thread – Backward & Forward!